It all started in Zul’Gurub, in 2005… wait a second, strike that. It started with World of Warcraft’s launch in 2004. WoW is a game with so much content that it’s impossible to have everything, and collecting achievements, mounts, pets or fashionable armour is not rare. I ended up taking a different route: since the old days of WoW, I have collected alcohol. When the game launched, alcohol was included simply for whimsy. Upon drinking, your screen blurred a bit, typed speech would slur and walking in a straight line was nigh-impossible. This was completely useless, yet tons of fun. Getting drunk was a money sink and a pastime you shared with friends, but the habit was also surprisingly cost-prohibitive. It’s difficult to get loaded on 40silver bourbon all the time when you had to save up for that expensive mount. Regardless, my friends and I imbibed with impunity, spending our time being social and ridiculous instead of grinding for cash. There was an unobtrusive island in the Zul’Gurub dungeon which nonstopspawned Darkmoon Special Reserve, the most potent alcohol in the game, and it could be looted for free. As a Druid, I would stealth around, dodging the murderous mobs, and fill my packs with a bounty of booze to share with friends. 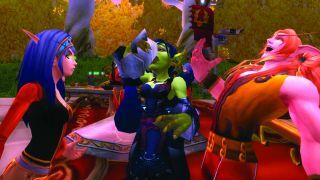 For a time, I was the guild drunk, my chat messages all punctuated by a “…hic!” Over time the prices of this habit became trivial, but I still had appearances to keep up. When achievements were released, guess which I got first? One thing I’d noticed is that although the achievement ‘It’s Happy Hour Somewhere’ required 25 beverages, the progress bar kept count of every unique drink above that amount, and since I was the guild boozer I took pride in raising that number. With some finagling, the game could show you a list of the drinks you had not yet consumed for further credit, and this is when the true obsession began. I started to appreciate how varied and difficult it could be to attain these absurd drinks. Some were obscure quest rewards, others required a special dungeon run or killing certain mobs. I got Alliance friends to sell Rhapsody Malt on the black market, or gathered pals to do a Dire Maul tribute run so Stomper Kreeg would sell me Gordok Green Grog. Mostly, these drinks functioned in the typical way, but Sulfuron Slammer actually set your character on fire. Suddenly, I was hooked: I needed to try as much of this booze as I could get, and the collection began in earnest. With every expansion to the game, it became clear that the developers were having loads of fun, and it was those little touches that made playing such a delight. Drinking Moonglow made your character sparkle, and Brewfest was an entire event based upon getting trashed, with items like a pony keg and amusingly, a keg pony. There were callouts to local breweries in Lavastone and Da Bruisery, and ingratiating yourself with a tiny tribe of murlocs allowed purchase of a Winterfin Depth Charge. This game was as obsessed with getting loaded as I was, and it provided a plethora of ways to go about doing so. An intrepid Rogue could pickpocket alcohol that would, presumably, be smashed into oblivion upon the mob’s death, so of course I made a Rogue with the express purpose of liberating liquor from the pockets of my enemies. In addition to adding whimsy to the world, alcohol seemed to cater to the roleplaying contingent of World of Warcraft. Buying a keg of Aged Dalaran Red wine displays a timer of 365 days, so if you keep it in your bank for a whole damn year it turns into a blue item, Peaked Dalaran Red! In the everexclusive Brawl’Gar Arena zeppelin, buying a single bottle of Moneybrau for one thousand gold makes you puke up piles of cash. Diligence in using Blingtron or an Ogre Brewing Kit sometimes yields exclusive alcohol not found anywhere else in the game. And it does absolutely nothing! It exists for the sheer joy of it! Finally, I joined a roleplay server with the notion of collecting, cataloguing and sharing every single alcoholic item I could, which still challenges me to this day. I have spent countless hours fishing, pickpocketing, murdering, repgrinding, questing and waiting for those special weeks (or even single days) in which an ingame event might have booze that I haven’t snagged before. I have even managed to contribute names to two drinks in the Kirin Tor Tavern Crawl: Mechs on the Beach and Entangling Rootbeer (I’m still fond of the unselected Val’Shiraz and Mrrrglrita). Little details can make a good game very special, and with every looted Half Empty Bottle of Prison Moonshine, I found a way to collect those nuances of creativity in the world and get wasted in the process. So if you’re ever on Moon Guard and see the Darkmoon Drink Society, ask for a cocktail. I’ll mix ya up somethin’ good …hic!